Well, I made it through the weekend and tore down my 50 gallon frag tank to make way for the new (to me) 90 gallon tank. I have had things ready to go for a while, but could not spare the time away from the golf course to do it. So now was my chance before the really cold weather sets in. 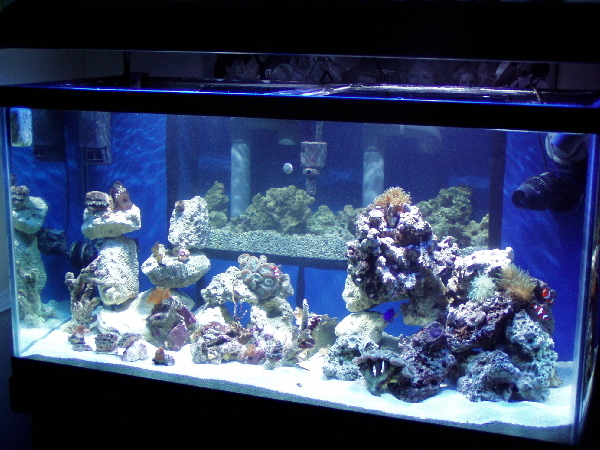 If anyone is interested in reading a very long post about this 90 gallon setup, you could see it here http://www.aquariacanada.com/forums/...ad.php?t=13283. Hopefully, I can manage to attach at least a couple of shots into this one. All seems to be well at the present time. i bet that overflow keeps the surface nice and clean, great job on the build. Well, my story has come to a sad ending. I came home this afternoon and my wife was bailing water out of the tank. It had developed a crack from the edge of the coast to coast into the corner about 1/2 way down. It was spewing like old faithfull. It was very good thinking on my wife's part to start getting water out before the tank actually came right apart. The floor is certainly wet, but drains toward the floor drain, so it could have been much worse. Meanwhile, I have put some live rock into the holding bins again. 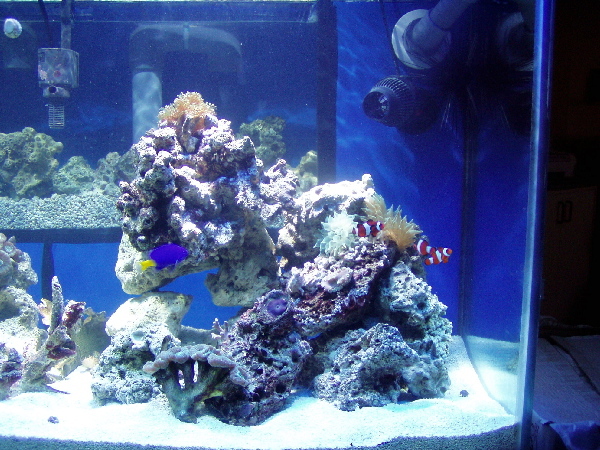 Moved a few corals into the other tanks and put the remaining live rock, corals and fish back into the 50 gallon frag tank. Good thing I didn't get rid of it yet! Oh well, it sure was a thing of beauty, I am greatly dissapointed. Strangely enough, my wife seems even more upset than I am. 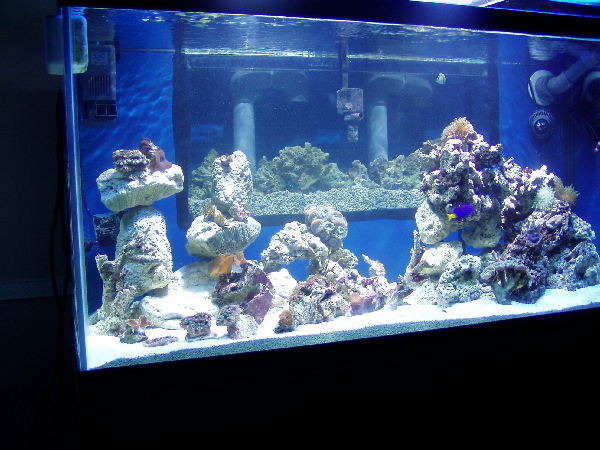 Guess I will be looking for another tank, I really need to bit the bullet and go for that 300 gallon tank!! 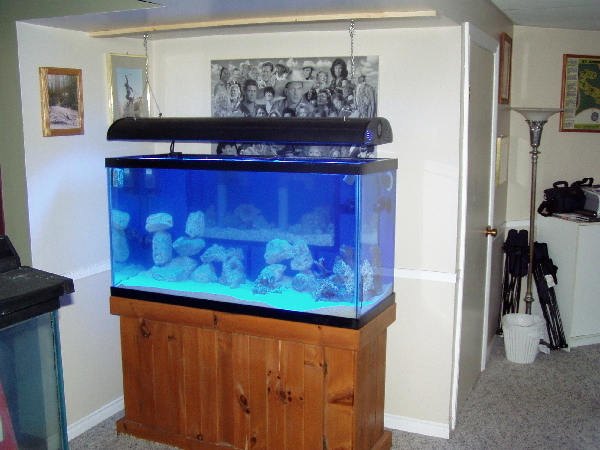 Sorry to hear about your tank but it's a great opportunity for an upgrade! ouch, im sorry it happened that way. It looked like a cool idea. Sorry it didn't work out. But if your like me with a few months to kick around until the snow melts and its time to pump off the course you have some time to come up with a new idea.